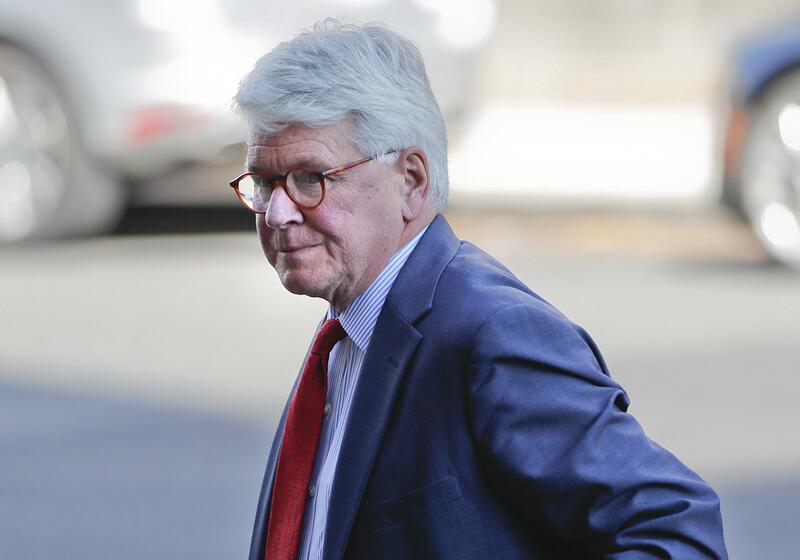 WASHINGTON – Attorney Gregory Craig, who served as White House counsel for President Barack Obama, was charged Thursday with lying to federal officials who were examining whether he should have registered as a foreign lobbyist for legal work he did for the Ukrainian government in 2012. The indictment stems from work Craig did with GOP lobbyist Paul Manafort while Craig was a partner at Skadden, Arps, Slate, Meagher & Flom, the law firm he joined after ending his tenure at the White House. Manafort, the former campaign chairman to Donald Trump, pleaded guilty last year to charges related to his Ukraine lobbying. “Mr. Craig is not guilty of any charge,” attorneys William Taylor and William Murphy said in a statement Wednesday. The charges each carry a maximum penalty of five years in prison, though if convicted, Craig would likely be sentenced to serve far less. The Justice Department concluded that Craig should have registered as a foreign agent because of contacts he had with reporters on the Ukrainian government’s behalf, according to the indictment. However, Craig was not indicted on a charge of violating the foreign registration act, whose five-year statute of limitations has expired. Craig, 74, is the first prominent Democratic figure to be charged as a result of a foreign lobbying investigation spun out of Mueller’s probe. The investigation led to the prosecution of Manafort, who was sentenced last month to a total of 7 1/2 years in prison for lobbying violations and financial crimes,and to a plea last year by another Skadden lawyer, Alex van der Zwaan, who admitted to lying to the FBI. Craig’s indictment represents a dramatic turn for a member of the country’s most elite legal circles. Craig attended Yale University’s law school with Bill and Hillary Clinton and later worked in the State Department and White House during the Clinton administration. An early Obama supporter, he served for a year as that president’s first White House counsel. He is also a veteran of the Washington-based law firm Williams and Connolly. The charges relate to work Craig did in coordination with Manafort, who admitted that he hadn’t properly register as a foreign lobbyist while working as a political consultant for Ukrainian President Viktor Yanukovych. Craig’s firm was hired in 2012 by Yanukovych’s Ministry of Justice to conduct a review of the prosecution of one of Yanukovych’s leading political rivals, Yulia Tymoshenko. The agreement included providing advice on improving prosecutions by the ministry and was part of a strategy led by Manafort to bolster Ukraine’s international image, according to court filings. Skadden produced a 187-page white paper that offered a mixed review of the trial and imprisonment of Tymoshenko, sayin gthe analysis it conducted of the case was independent. But human rights advocates said that the report had been engineered by Yanukovych’s government and that it whitewashed the jailing of his political opponent. And Manafort eventually admitted that he and other lobbyists used the Skadden report as part of a broad effort to improve Yanukovych’s reputation in the West after the widely condemned jailing of Tymoshenko. Manafort agreed that they didn’t disclose their lobbying effort, which included disseminating the Skadden report to U.S. government officials. The Ukrainian government reported that Skadden was paid $12,000 for the report, but prosecutors have said Manafort used an offshore account to route another $4 million to the law firm to pay for the work. According to the indictment, a wealthy Ukrainian citizen agreed to foot the firm’s multimillion-dollar bill. Skadden told the Justice Department in a January filing that it understood that the work “was to be largely funded” by Ukrainian steel magnate Victor Pinchuk, who has advocated closer ties between Ukraine and the European Union. Pinchuk’s representatives have denied that he had any involvement with the report. They did not immediately respond to requests for comment Thursday. Prosecutors said Craig sought to avoid registering as a foreign agent because he feared it would impede his future ability to reenter government service. He was also concerned that the disclosure that would be required would reveal the private payments – undermining the perceived independence of Skadden’s work, according to the indictment. But prosecutors allege that Craig sought to hide the payments the firm received from the wealthy Ukrainian. They said he worked with a lobbyist to create false invoice from Skadden to the Ukrainian Ministry of Justice, making it appear more of the firm’s bills were being paid by the government. Craig also sought to hide his involvement in the public relations strategy around the report – activities he had been advised would required him to register as a foreign agent, prosecutors allege. Craig recommended a public relations firm for the project and worked closely with it, and also emailed a reporter before the release of the Skadden report, writing that he would be happy to get him the report “and even happier to talk to you about it,” according to the indictment. According to the indictment, Craig sent Sanger a copy of the report and hand-delivered it to his Washington home. Sanger wrote a story about the report, quoting Craig, the next day. After Craig spoke to The Times and several other reporters, Manafort told Craig in an email that the Ukrainian government was pleased with the rollout. “People in Kiev are very happy. You are ‘THE MAN,’ ” he wrote, according to the indictment. Once Skadden’s role in the report was mentioned in news coverage, the Justice Department sought information from the law firm about whether its work, including the media contacts, required the lawyers to have registered as foreign lobbyists. Craig and DOJ officials exchanged letters about the topic through 2013. The Justice Department determined in January 2014 that the firm did not need to register, based on what prosecutors said Thursday were false statements by Craig. According to the indictment, Craig said in writing and in a meeting with staff from the Justice Department’s foreign registration unit in October 2013 that his contacts with the media had only been reactive and for the purpose of correcting misinformation. Prosecutors said Craig did not disclose that he had written the report with the understanding that it would be used by Manafort and the Ukrainian government to affect public opinion, that he had facilitated the hiring of a public relations firm and helped devise its media strategy and that he had reached out to Sanger to provide him a copy of the report and an interview before its public release. Skadden in January reached a settlement with the Justice Department, admitting it should have registered for its work in 2012 and 2013, and it agreed to turn over the $4.6 million in fees it made for the report in exchange for facing no criminal charges. In its settlement, Skadden agreed that the Justice Department’s 2014 finding that the firm did not need to register came after the agency relied on “false and misleading oral and written statements” made by Craig. In their statement Wednesday, Craig’s attorneys said he refused requests to participate in Ukraine’s lobbying around the report. Published: April 12, 2019, 9:15 a.m. Updated: April 12, 2019, 10:24 a.m.